The rapid development and innovation of technology has greatly contributed to the growth of the home and aged care industry of today. Although some are thriving, some are now faced with the challenge of staying up to date versus competitors that have found a way to navigate the recent aged care reforms plus the demand brought on by CDC and NDIS. With the industry serving millions of older Australians who are in need of quality care services, provider must focus more on improving the overall systems and process. Take advantage of the newest innovations and stay on top of the competition. With hundreds of clients requiring personal services on a daily basis, the paper trail is definitely lagging behind. Organising hard copies of records has never been easier thanks to the latest digital concierge technologies. Smartphone applications and cloud-based technology enable thousands of employees to easily store and retrieve data; A more convenient way of keeping records organised and up to date. The emergence of mobile phone and smart device applications has took the business world by storm and home care organisations are no exception. Like a mini computer, there are applications that allow aged care organisations to manage client tasks, receive or respond to booking requests, send photos or text messages, plus change schedules in real time. Such applications also streamline the reporting processes and provide a better communication method between the primary carer and the client's family. Service culture is a primary facet of home care, from providing services, communication, and marketing, to the look or feel of the facilities. A service-driven culture begins with customer needs, hence the importance of utilising a platform which provides the necessary features to the care team. Provide the right tools for staff to make adjustments upon client request, stay on top of tasks, check-in and out of scheduled appointments, and share reports in real time. Technology enables aged care industry growth. In effect, it improves community engagement and wellbeing. Constant communication and involvement with the clients' family and friends build trust and confidence in the team. The more they love your work, the more they are likely to provide positive recommendations and brand exposure for your company. The increase in brand equity will help you open new services and revenue opportunities, including increasing referrals. 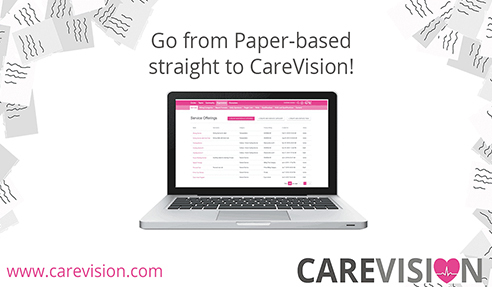 From technology advancement to communication growth, CareVision provides innovative ideas and cross-platform solutions that can effectively bring your aged and home care organisation ahead of the competition. Book a demo and learn more by calling CareVision at 1300 324 070 or visit www.carevision.com today. I would like to enquire about CareVision.